One of Russia’s brightest contemporary jazz musicians Oleg Butman, who performed with his quartet at the 3rd Delhi International Jazz Festival spoke to RIR about his music, his impressions of India and what the country means for contemporary jazz. Oleg, is this the first time you've played in India? It is. It’s the first time we’ve played in India, and it’s actually the first time I’ve ever been to India – we are all here for the first time. But we’re desperately happy to get here at last and see this wonderful country. Can you tell us a little about your quartet and its players? My quartet has been around for three or four years now. Before then I was living in the United States, where I was busy with solo projects and a quartet in New York. We played all over the country with vocalist Svetlana Portnyanskaya, and I played with other musicians too. But that quartet remains there in New York. The guys I play with in Moscow, and who are here with me in Delhi, are all exceptional players. They all have their own solo projects. We’ve got Ivan Farmakovsky on piano, Anton Revnyuk on bass and Sergei Golovnya on sax. We’re only playing instrumental numbers, so we don't have a vocalist with us – it’ll be instrumental jazz music. Do you write the music yourself, or do you play covers? We write all our music ourselves. We’re going to play my stuff here in Delhi, as well as some of Sergey’s and Ivan’s tracks. It’s all our own stuff. The music we’re playing in the festival is contemporary jazz. Of course, we’ll be doing some improvisation too – that’s the whole core of the idea of jazz. We play some different melodies, and then we improvise around them. We’ve brought some different rhythms with us to Delhi – swing, some Latin ideas, ballads and waltz. Have you already put out any of your own discs? I’ve got two albums out of my own music; you can get them on Amazon.com. Ivan Farmakovsky has recorded two albums with his own line-up. It’s really great for us to be here – we’ve never been here before. What are your impressions are of Delhi? People were telling us before we left that it was a dirty place, but Delhi's really impressed us. We’ve seen the city and its sights – everything’s been great. It’s wonderfully green and sunny. Is India on the contemporary jazz map yet? Of course India’s on the jazz map! There are plenty of American and European jazz musicians performing alongside players from India, and they’re amazed by their music. The whole thing began with Ravi Shankar. There are a lot of jazz musicians today who study traditional Indian music. They’re interested in studying the rhythmic traditions in Indian music. Indian music has a big influence on contemporary jazz. Would you say that jazz is still popular in Russia? Hey, of course! There’s a huge fan base in Russia, and there’s a lot of interest in this style of music. It’s no accident that almost every major city in Russia has its own jazz festival. Oleg Butman was born in 1966 in St Petersburg. He began playing drums when he was 8 and made his stage debut when he was 15. After finishing his studies and a number of successful concert performances in the USA in the 1990s, he returned to Russia and began a series of different projects. He’s played with American jazz greats such as John Faddis, Billy Taylor, Grover Washington and Pat Metheny. The Third Delhi International Jazz Festival was organised by the Indian Council for Cultural Relations, and took place in the capital’s Nehru Park on March 15-18. 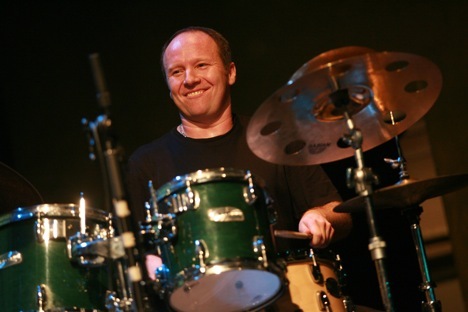 Fourteen major ensembles took part in the festival, including Ararat (Israel), Imany (France), the Radha Thomas Ensemble (India) and the Oleg Butman Quartet.